Social work in Australia – If there is a discussion that is interested in outcomes and changes influenced by the Indigenous voice, you can count me in. At the Joint World Conference on Social Work, Education and Social Development I had the opportunity to deliver a presentation, ‘A culturally responsive social work application of Indigenous and western ways of thinking and doing when responding to Indigenous sexual diversity in a young, Indigenous male client’, the fourth in a series of five presentations I am undertaking this year. These presentations have been thematically linked to the social and emotional wellbeing of Indigenous people who fit the description of gender variant and sexuality diverse, or the more common acronym of LGBQTI (lesbian, gay, bisexual, queer, transgender, intersex). Two presentations have been on suicide prevention for this particular group and the third looking at the intersectionality of Indigeneity, gender variance and diverse sexualities and how to identify the social determinants of health affecting this group. Attending the conference provided me the opportunity to use the decolonisation framework in Lorraine Muller’s text, ‘A theory for Indigenous Australian health and human service work’ (2014), in my presentation. The six stages of decolonisation in the book are: (1) Rediscovery and Recovery, (2) Mourning, (3) Healing/Forgiveness, (4) Dreaming, (5) Commitment and (6) Action. The six stages of decolonisation present a culturally responsive understanding that can be applied to social work; one that feels safe to use. This is important. It will be a framework that I will use time and time again as an Indigenous social work practitioner when working with an Indigenous partner. I use the term ‘partner’ in the context of a partnership with the individual, family or community we are working alongside. I am not a fan of the term ‘client’ as I believe it implies a power balance that is not conducive to an anti-oppressive space of interaction. Social work and social workers should not be interventionist(s) but rather sharers of practice, skills and theory through application not intervention. My presentation was within the ‘Strengthening social and cultural wellbeing: Indigenous perspectives’ stream. It was great to catch up again with Michael Hart, who presented a paper titled ‘Indigenist social work: Culturally safe means to overcoming oppression and supporting wellbeing’, as well as network with the other local and international Indigenous delegates. When Marina Marcela Herrero, from Brazil, presented ‘Revitalization of Indigenous cultures at risk’ it was in her native tongue and although I couldn’t understand any of what was being said the accompanying video and the tones of her voice did assist in telling her story and her presentation. However, as I was sitting there I was reminded of how privileged I am being a speaker of English. It also reminded me that when it comes to Indigenous social work and our giving and receiving care styles we should not have to be in constant explanation mode. It should not always be up to us to explain, but that others need to make the effort to understand. Prior to the conference I logged onto the live streaming of the IFSW General Meeting and was extremely happy to see ‘Indigenous knowledges’ included in the new definition of social work. I give full credit to the IFSW and the international organising committee of the SWESD gathering, as the live stream was a great idea. 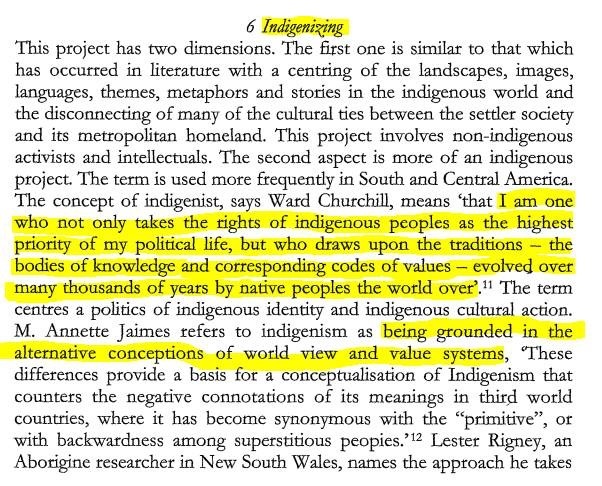 The inclusion of ‘Indigenous knowledges’ in the definition did set up quite a bit of expectation of Indigenous peoples’ inclusion throughout the three days. It is great when a local Indigenous person gives the Welcome to Country, I always feel deeply about hearing another Indigenous person’s language. I would have liked to have seen Indigenous content in the opening plenary session itself. There is perhaps a bias that I carry in regards to Indigenous content because I do believe it to be an emerging area of social work theory and practice. I also believe it to be very exciting, especially for Indigenous students of social work, that we now have two texts to draw on, Lorraine’s, mentioned above, and ‘Our voices : Aboriginal and Torres Strait Islander social work’, edited by Bindi Bennett, Sue Green, Stephanie Gilbert and Dawn Bessarab. These books need to be essential texts across all tertiary teaching institutions. Indigenous people, particularly in the Australian context need to be more recognised within social work as researchers, authors, practitioners and educators. This needs to be imbedded in social work education rather than placing us consistently as ‘clients’. I will also use this opportunity to advocate for the inclusion of more assessments tailored toward responding to the needs of Indigenous people. We are not a homogenous group and our needs are as diverse as the people we are. I have to tip my hat to the AASW for providing these scholarships. I took away more from the conference than what I can write about here. It was great that once the Aboriginal and Torres Strait Islander flags did arrive they were displayed prominently at the AASW booth. They certainly coloured the place in. Both ‘A Theory for Indigenous Australian Health and Human Service Work and Our voices: Aboriginal and Torres Strait Islander social work’ were available to buy at the conference or online. Lorraine’s book sold out to local and international guests, which I think is just fantastic. There is no doubt that more can be done to enhance and strengthen social work in Australia and if there is a discussion that is interested in outcomes and changes influenced by the Indigenous voice, you can count me in. Categories: Conferences, Dameyon Bonson, Decolonisation, Indigenous, Public Health | Permalink. While the Forrest Review has been billed as a review of Indigenous training and employment, it is important to note that it has clearly been framed with the specific activities of the Australian Employment Covenant and GenerationOne in mind. Its overarching purpose has been to provide recommendations ‘to ensure Indigenous training and employment services are properly targeted and administered to connect unemployed Indigenous people with real and sustainable jobs, especially those that have been pledged to Indigenous people by Australian business’ (in Forrest 2014, p. 224, emphasis added). While the jobs pledged under the Covenant are not referred to explicitly, the connection to the Covenant and GenerationOne’s VTEC model are clear. The Review states that employers have now made 61,000 pledges under the Covenant and 18,700 of these pledges have been filled. Further, it says that of the 16,000 jobs for which there are available data, 75 per cent have been retained to 26 weeks (Forrest 2014, p. 38). As noted in the previous discussion about the Covenant, these figures rely on fairly limited reporting from employers to GenerationOne, and do not identify whether the employees have moved out of unemployment to fill these positions or simply moved across from other jobs. Nor do they indicate whether the same employee has filled more than one of these positions over time. Moreover, even if we take the numbers at face value, using them to support the argument for replacing existing services with VTECs is curious because, until January 2014, the only VTEC in operation was FMG’s facility that has so far assisted around 1,000 Indigenous people into jobs (Fortescue Metals Group Ltd 2014). That would suggest that the remaining placements have been possible within existing arrangements including JSA and IEP. Responses from the Aboriginal and Torres Strait Islander community and some of our true leaders. National Aboriginal and Torres Strait Islander community leaders have called on Prime Minister Tony Abbott to personally step in to address the federal Indigenous Affairs policy and funding environment, which they say is “descending into chaos”. Representatives of the elected Aboriginal and Torres Strait Islander representative body National Congress of Australia’s First Peoples (Congress), National Aboriginal and Torres Strait Islander Legal Services (NATSILS), National Family Violence Prevention Legal Services (NFVPLS), National Aboriginal Community Controlled Health Organisation (NACCHO), Secretariat for National Aboriginal and Islander Child Care (SNAICC), and the Healing Foundation – supported by the Australian Council of Social Services (ACOSS) – met in Canberra today to discuss the detrimental impact of the 2014 Federal Budget on key organisations and frontline services. iii) the lack of focus and ongoing funding on health preventative programs and initiatives, particularly those delivered through National Partnership Arrangements. The call for a National Summit of Traditional Owners announced last week by three icons of the First People’s struggle, Tauto Sansbury, Geoff Clark and Michael Mansell, has gained momentum. They have been inundated by the true leaders of First People from all around the continent. Many Elders believe there is a tumultuous political climate and that they are seeing an inevitable fast-tracked land grab by this Government and by coteries of already wealthy predatory carpetbaggers. They believe that they are at the crossroads, that if they do not stand up united and strike back that what little has been won in the last 50 years will be lost forever. The group issued a statement saying that, despite Government assurances to the contrary, Budget cuts to Indigenous Affairs were impairing the ability of community-controlled organisations to deliver frontline services in critical areas such as legal assistance, family violence, children, youth and women, drug and alcohol misuse, and health. Categories: Articles of Interest, Decolonisation, Indigenous | Permalink. Society for Mental Health Research (SMHR) 2014 Conference being held from 3-5 December 2014 at the Adelaide Oval, Adelaide, Australia. 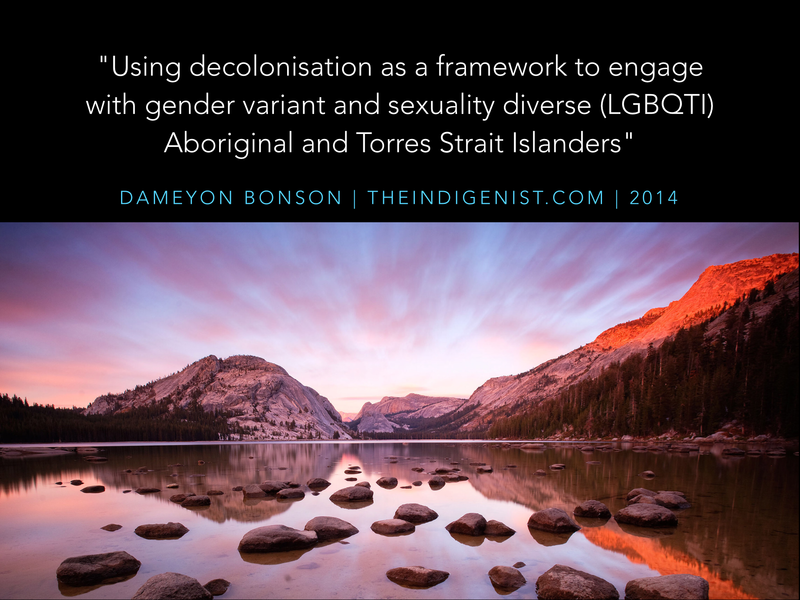 Categories: Conferences, Dameyon Bonson, Decolonisation, Indigenous LGBQTI - Black Rainbow, Mental Health, Two Spirit | Permalink.